Lantech LPGS-2424C-240W is a 24-port 10/100/1000 Base-TX + 4 1000T/100 /1000M SFP Combo w/24 PoE 802.3af/at Injectors L2 managed Ethernet switches which supports full SNMP features, including QoS for 8 queues, 801.q VLAN, IPv6, IGMP v1/v2/v3 as well as QinQ. LPGS-2424C-240W supports IEEE 802.3at PoE technology, up to 30W per port and provides maximal 240W for total PoE power budget with per port setting of PoE budget and monitoring. 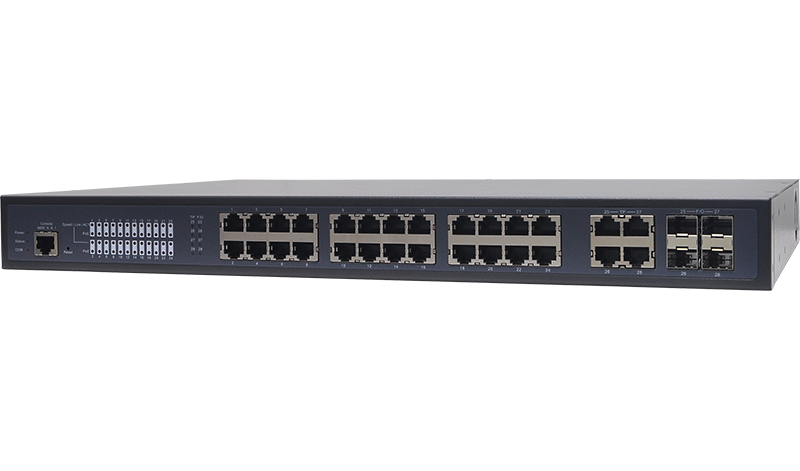 The Ethernet switch features advanced security function including SSHv2, RADIUS and TACACS+ authentication, ACLs as well as supports IP Source Guard to anti-fake DHCP server or illegal IP address to access the network. With advanced SNMP and security function, LPGS-2424C-240W is the best Ethernet switch to connect with IP Camera, Setup box, VoIP phone / router, Wireless Equipments for MTU, Transportation or Surveillance applications. -IGMP querier is used to support a Layer 2 multicast domain of snooping switches in the absence of a multicast router. LLDP Traffic on a port can be mirrored to another port for analysis with a network analyzer or RMON probe. Up to 8 source ports can be mirrored to single destination port. A single session is supported.